The quartet which forms Slaughterhouse was mostly, undervalued, mostly unloved artists who while talented had failed to make the major impact they were once seen destined to do. Upon the first song, and subsequent clamor for more, they realized there was indeed an audience which wanted to hear four hot lyrical emcees get together and rip tracks. Their combined power propelled them to get recognition by the mainstream and that reached a critical mass when last year, they signed with Eminem and Shady records. Since then everyone has been waiting to see if they could live up to the combined expectations that come with their new high profile. 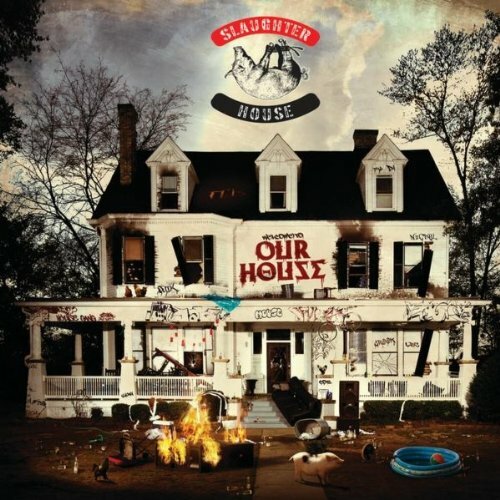 So with nothing further, let's get into he album review of the new Slaughterhouse album release, "Welcome to Our House". The opening intro is definitely Eminem influenced, but isn't an actual song. The first song is "Our House" which features the 'boss' Eminem and Skylar Grey. The only one who takes a back seat on this is Joe Budden who handles a slight bridge in a song that amounts to everyone talking about how they want to be seen in hip-hop and/or where they fit in. Crooked I has the best verse by the way. Busta Rhymes pops up to handle the hook on "Coffin'" this is more of a shot at getting a pop single in the veins of Ante Up which didn't really start that way. "Throw That" reminds me of a D12 song in the way it sounds. Em is also featured on this ode to strippers. This is followed up by the original single, "Hammer Dance" which still has an infectious beat. "Get Up" is about the personal come backs each of them has gone through to get back to the point they were long expected to be. "Flip a Bird" attempts to bring some more straight forward street credibility to the album and the sound is kind of weird. Joe Budden's verse about how his parents drug use affected him is well documented but stands out on this song. Swizz Beatz is on "Throw it Away" which is what they should probably have done when he came with the track and offer to do the hook. It's not the worst song in the world but it doesn't feel right. Skylar Grey also features on "Rescue Me" and of course there is the Cee-Lo feature "My Life"
"Frat House" seems like it was a good idea, but it doesn't get over. "Goodbye" is what Slaughterhouse is known for. Being able to be lyrical yet expose themselves with deep lyrics about the portions of their lives we somehow manage to not be privy to. "Park it Sideways" is trying to be different about speaking on having money, in other words, swagger rap. "Die" is another visit back to the street territory where they go in about what's going to happen if they get pushed to the limits. The regular version of the album ends with "Our Way". Bonus tracks are "Asylum" with Eminem which could have replaced something else on the regular track list though it isn't really a great song at least its different, "Walk of Shame" about the groupies after a night of fun should have definitely replaced the swizz beatz track, "The Other Side" is about dealing with the game and being famous, and "Place to Be", with B.O.B. , which isn't about anything really but should have been on the main listing as well. This album is tough to look at because there is a lot of weight being put on these artists and they don't live up to it. There was too much time and too much label intervention or something because it is very overproduced and to sum it up, watered down. It sounds too much like the past releases that have come from the Shady records imprint where they force the need for massive sales on instead of letting the artist do what they do best which is normally how they got there. The production doesn't fit as much, the drums and bass lines don't hit quite right and have the same energy as on the self titled initial album. Lyrically, Crooked I steps up more than the others this time but too much is a jumble of pieces that wasn't necessary.